"This popular dish originated around Monterey Bay, California. This version, created in San Diego, has a southwest flavor. Serve with large bibs, crab shell crackers, extra bowls for the shells, and finger bowls if you wish. Nice served in large, shallow bowls alongside crusty sourdough bread, a green salad, and chilled white wine. You can vary the seafood according to the catch of the day, yours or your market's." Heat the oil in a large stockpot over medium heat. Stir in the onion, celery, carrots, potatoes, and garlic, and cook 5 to 10 minutes. Add parsley, cilantro, tomatoes, tomato juice, clam juice, white wine, basil, oregano, thyme, chili powder, cayenne pepper, salt and black pepper. Reduce heat and simmer for 2 hours. 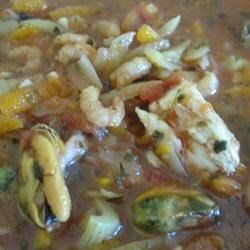 Approximately 15 to 20 minutes before you are ready to serve the cioppino, stir in the fish, shrimp, mussels, clams, crab, and scallops. Continue to cook and stir approximately 5 minutes, or until the shrimp are pink and the clams and mussel shells have opened. Remove any unopened mussels or clams before serving. See how to make San Francisco's famous seafood stew! Too much vegtables. Its like taking a Ciappino and turning in to an ordinary seafood stew. Fantastic soup. Everyone loved it. Excellent! Takes some time to prepare but definately worth it.